Cincinnati, capital of The Great Lakes Region, United North America. A police detective’s wife is brutally murdered. Autocrats concealed behind a pervasive and corrupt bureaucracy bury the case and threaten to do the same to anyone—cop or not—who seeks to uncover the truth. If there’s to be any retribution for the dead woman, it will come from an unlikely source: an iconoclastic former military investigator called Feral Justice. But Feral is facing his own rendezvous with death. Without warning, his Lifesign—an infallible genetic marker—signals that he will soon die. 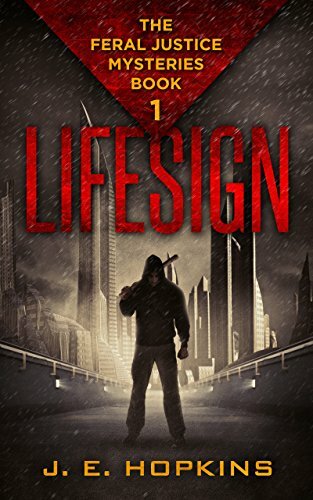 Outcast and cut off from society, he joins the homeless on the streets of a dystopian Cincinnati crowded with climate refugees. His only chance for social redemption and survival is to solve the murder and find a reprieve from his Lifesign in a secretive network used only by traitors. This suspense-filled mystery is populated with intriguing characters, including Feral’s smart-mouth embedded AI and a feisty partner with a penchant for leather and exposed body parts.